Small rolls of leaves packed with pollen are the brood chambers of leaf cutter bees. Just before the holidays a student arrived in our laboratory with a sturdy hunk of tree trunk that had been split to reveal a rotten cavity riddled with galleries. Within these galleries were several small bundles of carefully rolled leaves. Each bundle looked like a miniature cigar composed of dozens of small circular leaf sections carefully assembled into a cylinder. Each small wrapper contained residues of pollen. These curious creations were the work of one of our most important and interesting native pollinators, the leaf cutter bee. Rose leaves are one of the favorite sources of building materials for leaf cutter bees. 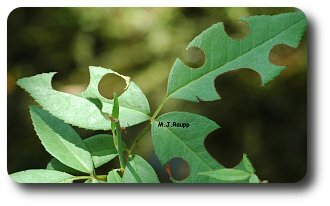 Leaf cutter bees leave other clues of their presence as they visit our landscapes. While gardening or simply communing with vegetation, you may have seen roses or other trees and shrubs with almost perfectly round circles of tissue removed from their leaves. The artisans behind these creations are leaf cutter bees. These small hairy bees are solitary and do not build large colonies like honeybees or bumblebees. Each female leaf cutter bee builds a nursery for her young. During the summer, leaf cutters construct nests in voids of trees, hollow branches, or within the pithy stems of plants such as raspberries and roses. Once a suitable nest site has been found, the leaf cutter bee clips small circular sections of leaves and transports them back to the tree or shrub where they are used to line a hollow chamber within the branch or stem. A very hairy belly helps the leaf cutter bee carry a load of pollen back to the nest. After assembling the leaf disks to form a hollow tube, the leaf cutter gathers pollen and nectar from nearby flowers and packs the tube with these nutritious provisions. An egg is then deposited in the tube and the next chamber in the nursery is built with leaf disks and stocked with pollen. This continues until several long tubes line the gallery. Eggs placed within the rolled leaves hatch into small legless larvae that eat the pollen. 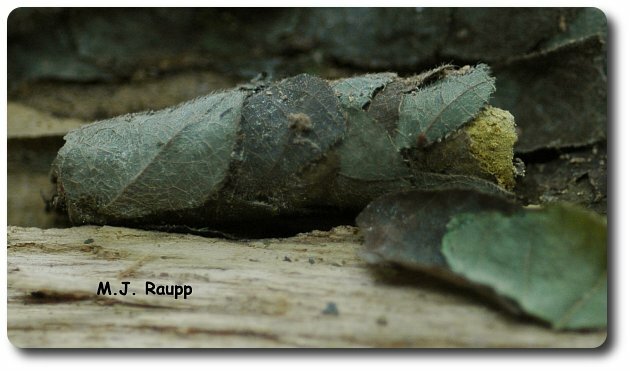 After the larvae have completed development, they form pupae from which emerge adult leaf cutter bees that spend the winter within the rolled leaves. With the arrival of spring and new supplies of tender leaves, nectar, and pollen, adult bees emerge and begin the work of finding mates and making brood chambers for the next generation of leaf cutter bees. Leaf cutter bees are extraordinarily docile and unlikely to sting unless severely provoked. They are important pollinators of several agricultural crops including blueberries and alfalfa. So, next spring keep an eye open for small hairy bees collecting pollen in your garden and try to observe their precise handiwork on your curiously clipped leaves. For more information on leaf cutter bees, please visit the following web sites.